Preparing for graduation? 5 things you have to do! 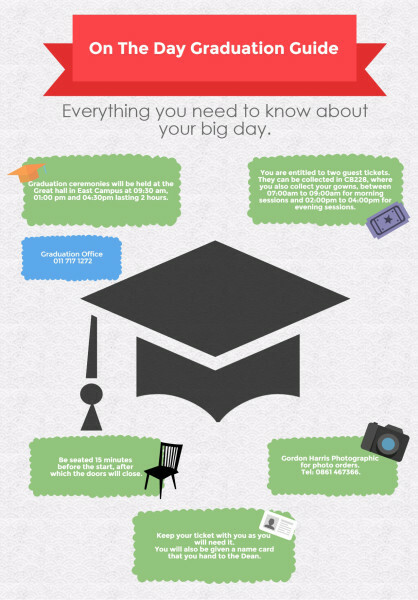 CLICK TO ENLARGE: On the day graduation guide. Graphic: Dana Da Silva. Graduation week is upon us yet again. Wits Vuvuzela offers some tips for getting through the event effortlessly. There’s nothing more exciting than getting that “congratulations! You are soon to be a Wits graduate”, email from your Faculty after slogging through that undergraduate degree. But before you hold that prized degree certificate in your hand, there are number of things that must happen. Don’t worry #teamvuvu has selected the essential “to do” list for the week before graduation. 1. Verify your graduation date and time a week before and put it in your calendar (this should be on your Wits student email). The gown for all Bachelor and Master degrees of Wits University is basic black. The hoods reflect the colour or colours of a particular degree or associated degrees. NB: You can either hire or buy (Wits uses the House of Gowns as our main supplier) here’s a price list and the procedure to follow. Each graduate will be allocated two guest tickets except for PhD graduates who will be allocated three tickets. Married graduates will be allocated an extra guest ticket but this is only through pre-ordering. In keeping with the formal nature of the Wits graduation ceremonies, the university stresses the importance of a formal and respectable look. This is a memorable moment, capture it and tag @WitsVuvuzela and Wits University with hashtag #MyWitsGrad on social media.